Thursday and Friday’s candle on the usd to cad daily chart, provided a pause point, as the market took a breather following the steep falls of earlier in the week, with Friday closing as a narrow spread down candle. 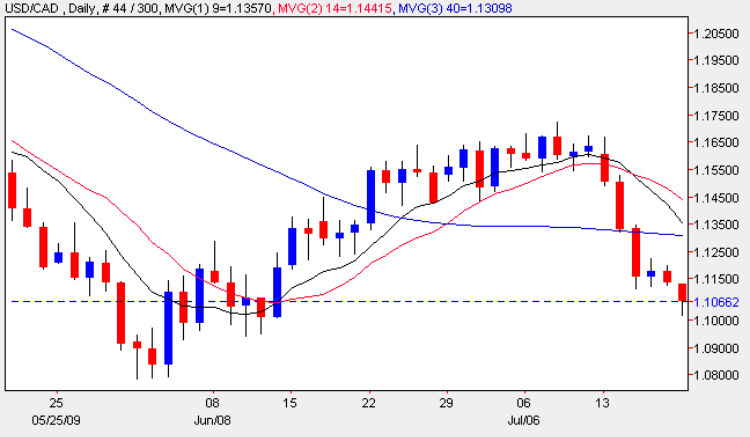 The bearish picture remains firmly in place for the usd to cad, and with all three moving averages pointing firmly lower, we should see the currency pair continue to fall this week, providing plenty of trading opportunities on the short side. In the short term we should see a re-test of the 1.08 price level, where the move stalled before, and this may well re-occur. Moreover, should this level be breached this time around, then 1.05 becomes the next target which then opens the way to a move back to parity in due course. For the Canadian dollar today, we have had two items of fundamental news on the economic calendar today, namely the Foreign Securities Purchases, closely followed by Wholesale sales. The first of these is the total value of stocks, bonds and money market assets purchased by foreigners during the month and indicates the level of demand for the currency abroad, which has come in at a staggering 18.89bn versus a target of 7.17bn, representing a huge vote of confidence in Canada and the Canadian Dollar. The second item of fundamental news was the Wholesale Sales numbers which too came in better than expected at -0.3% against a forecast of -2.0%, the decline being the smallest in 8 months of falls. As this is considered a leading indicator the better than expected number as positive for the Canadian Dollar. The only item of fundamental news on the economic calendar for the US was the CB Index which too came in better than expected at 0.7% against a forecast of 0.5% and taken by analysts as an indication that the worst of this slump may be coming to an end. If this view is accepted by the market this would further fuel risk appetite with a consequent move away from the US Dollar.